The Brooklyn Bridge as seen in The Super Mario Bros. Super Show! The Brooklyn Bridge is an old suspension bridge linking the New York City boroughs of Manhattan and Brooklyn. It has been mentioned on a few occasions throughout the Mario franchise, and was even traveled to at one point. 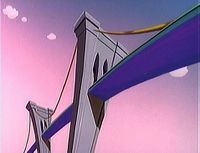 The Brooklyn Bridge is mentioned during several of The Super Mario Bros. Super Show! 's live-action segments. Additionally, it can be seen during the establishing shot of Mario Brothers Plumbing at the start of nearly every segment. In "All Steamed Up", Sgt. Slaughter calls Mario and Luigi to inform them he is stuck in traffic on the Brooklyn Bridge on his way over to Mario Brothers Plumbing. However, he informs them that since he is driving a Sherman Tank, he can take a shortcut by crashing through the other vehicles. In "Mama Mia Mario", Mario's Mama orders her son to wash the Brooklyn Bridge (among other, equally ridiculous assignments). In the animated episode "Flatbush Koopa", the Brooklyn Bridge is an actual plot point. At first, the Brooklyn Bridge is simply one of the landmarks Luigi points out when he and Mario first arrived in Brooklyn. At one point, King Koopa announces that the Brooklyn Bridge, along with everything else to do with Brooklyn, is to dubbed the Kooplyn Bridge once he succeeds with his takeover. Later on, King Koopa, having ditched Mario and his friends at Coney Island, ventures to the Brooklyn Bridge, along with several Koopa Troopas and Bob-Ombs. King Koopa announces that by destroying the Brooklyn Bridge, Mario's group is unable to catch up with them while he takes over the rest of the city. Mario's group manages to catch up with King Koopa, but keep their distance from him. Mario and Luigi then leave to get help, while King Koopa tosses several Bob-Ombs off the bridge, and attempts to blow it up at its base. After doing some minor damage, Mario and Luigi return with several police officers, but King Koopa uses his Koopa scepter to turn them into bricks, which the Koopa Troopas toss at Mario and Luigi. Toad then steals the scepter from King Koopa, and Princess Toadstool uses it to turn the police officers back to normal. While the police officers pursue the Koopa Troopas, Toad convinces King Koopa to follow him back to the Mushroom Kingdom, as he is holding his scepter. King Koopa then abandons his original plans, and leaves the Brooklyn Bridge to chase Mario's group back to the Mushroom Kingdom. At the start of the Adventures of Super Mario Bros. 3 episode "Misadventures in Babysitting", Mario and Luigi accidentally wind up at Junior's house, which leads to mild confusion for the two brothers. Mario is easily able to identify where they were, as he sees the Brooklyn Bridge when he peers through the kitchen window. In Super Mario Odyssey, as New Donk City of the Metro Kingdom is based on New York City, a bridge strongly resembling the Brooklyn Bridge can be seen in the background. This page was last edited on March 20, 2019, at 20:02.